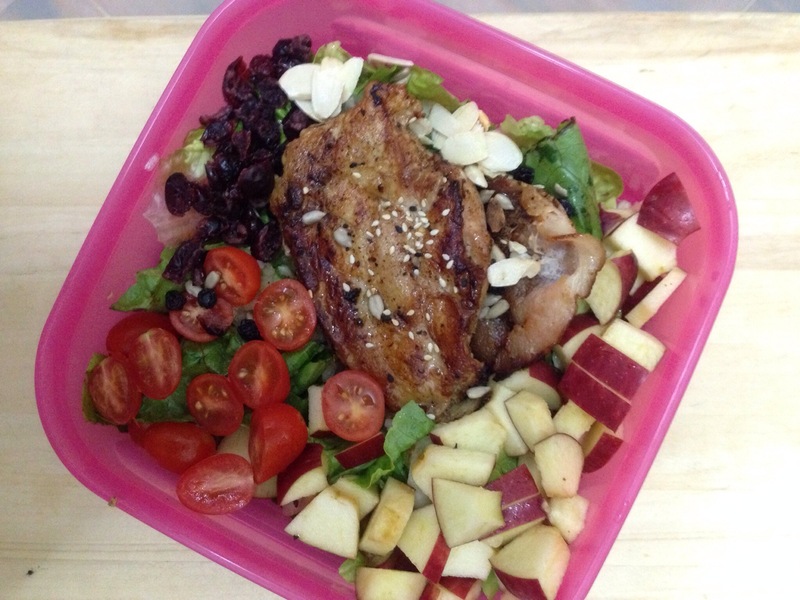 Lunch box of the day #7 chicken breast , bacon salad | Taste with your eye, the wow factor! Another humble homemade lunch box, opened my mini fridge , found chicken breast & bacon. Decided a la minute marinated chicken with rosemary herb, paprika powder, black pepper powder, Japanese spice powder, fish sauce , maggi soy sauce on non stick pan, pan fried it with slow fire. Layer romaine lettuce , add on cherry tomatoes , bacon,apples , dried black current, dried cranberry , sprinkle sesame seed, sunflower seed & almond flake. Upon indulge it, serve with Japanese sesame dressing .